Bhadrak:23/12/18: Nuclear strategic ballistic missile Agni-IV was successfully test fired off Odisha coast on Sunday morning. The launch took place from the integrated test range at APJ Abdul Kalam Island off Odisha coast at 8.30 am. The sleek missile having 4000-km strike range is a two-stage missile. It is 20 meter-long weighing 17 tonnes. Agni-IV missile is equipped with state-of-the-art Avionics, 5th generation on-board computer and distributed architecture. It has the latest features to correct and guide itself for in-flight disturbances. Agni 4 was first test fired on 20 January 2014. The missile includes indigenously developed ring laser gyro and composite rocket motor. The two stage Intermediate Range Ballistic Missile, IRBM can take a nuclear warhead of one ton. The most accurate Ring Laser Gyro based Inertial Navigation System (RINS) and supported by highly reliable redundant Micro Navigation System (MINGS), ensures the vehicle reaches the target within two digit accuracy. The re-entry heat shield can withstand temperatures in the range of 4000 degree centigrade and makes sure the avionics function normally with inside temperature remaining less than 50 degree centigrade. 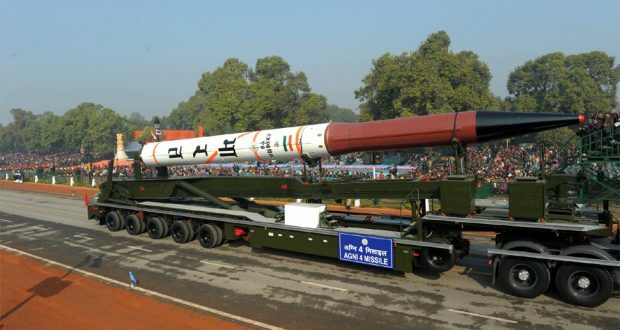 Agni series of missiles was conceptualised by Indian defence planners in the 1980s keeping in view India’s threat perceptions, particularly from its neighbours. The two-stage Agni technology demonstrator, with a solid-fuel first stage, was first tested at the Interim Test Range in Chandipur in 1989. It was capable of carrying a conventional payload of 1,000 kg or a nuclear warhead.